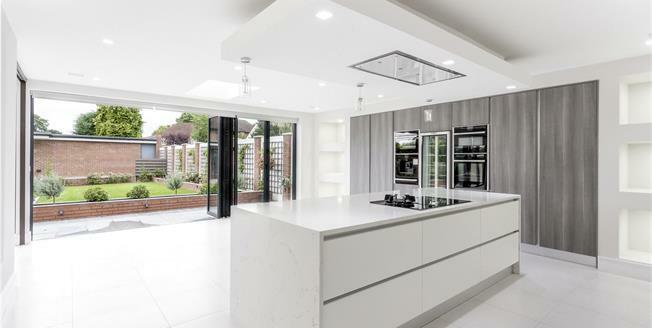 Situated on the corner of Stanmore Hill and Heriots Close, prominently sits this stylish and contemporary detached residence which has been meticulously maintained and upgraded by the current owners to provide a delightful property designed to suit modern family living. The accommodation offers engineered wooden flooring and under floor heating throughout , contemporary glass balustrades, a Control 4 media system with touch screen control panels and newly fitted double glazed windows The house is placed behind a large front garden which sets the property back from the road. To the rear of this spacious residence the accommodation benefits from a delightful landscaped family garden with a separate newly built structure to the rear which houses a spacious studio/study/gym with washroom facilities and a single garage siding on to Heriots Close which provides the house with off street parking.